I am not sure when groin vault ceilings first came onto my radar, but I have admired the beauty of this architectural feature for a while and even wrote a blog post about them last year (http://www.thingsthatinspire.net/2010/03/groin-vault-ceilings.html). 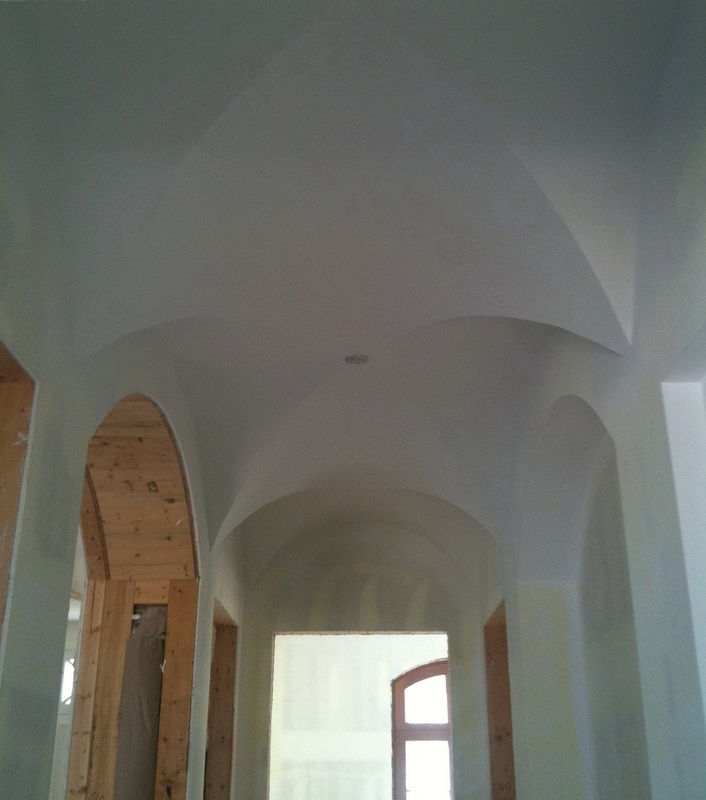 In the house we are building, we had the perfect little hall for a groin vault ceiling, and my architect thought it would be a great ceiling treatment for the space. So here it is! My designer has not yet selected a light fixture for this space; although virtually all of the lighting has been ordered, there are a few places where we wanted to see how things came together before selecting the fixture. Now that the interior finishes are beginning to take shape, I will be featuring peeks into the house on a regular basis. Up until this point, most of the activity has been structural, which is very important but not terribly exciting. I am thrilled that we are finally into the interesting part of the build! Ceiling looks great. I also like the "depth" of the walls on either side. I can see lots of great natural light flooding in too. Well done. Incredible! Many people get so bored with the "structural" part of construction, but I LOVE it, it's the last step before you can finally see it the final piece! Great choice for the hallway! Gorgeous ceiling! I love it! It's looks complicated to create...just beautiful! It's stunning, Holly...can't wait to see the chandelier you pick!! Oh! So beautiful the picture of the vault ceiling! I also love the architecture of those ceilings! Just stunning! Wow, lucky you, that is some kind of hall ceiling, so beautiful! I love it...can't wait to see more! Love seeing the process but like you said -it's not fun till the finishes start to go up. Can't wait to see the 'after'! Beautiful! Groin vaults add such character and history to a home. Love seeing your progress shots! I really enjoyed going back to read your earlier post on groin vault ceilings. I can certainly understand why you wanted to find the perfect spot to incorporate that element in your design. I hope it will be a semi public space so your guests can enjoy it as well. What a student of architecture you have become during this process and all the better your house is for it. I agree with the architect who said, ceilings are the most under utilized space in a house. I couldn't agree more. Now, on to improving mine. Holly, this is a technical question but you will most probably know the answer. To do a groin vault ceiling, must the space above the ceiling not have a room so that the vaulted area reaches into space that would otherwise be the floor of the room above it? I know this is a question for most architects, but in your own home, is that the case? Groin vault ceilings are one of my passions. Looking forward to seeing how you treat them! A very special treat in this day and age! Just lovely! Thanks for sharing the whole journey. I love your style of writing as well. Just bonus. Enjoy your day! OH Holly...I love the effect of groin ceilings and you picked an area that pulls it off perfectly! Can't wait to see more...inspirational! Oh...I'm so jealous. I love it! Thank you for the comments, everyone! When we were talking about doing this feature, I kept asking my architect if a groin vault ceiling was right for this house, and not 'too much', and my architect said that he loved this feature. It also plays well into the kitchen, which has a lot of interesting ceiling shapes - more on that later! Anon asked "this is a technical question but you will most probably know the answer. To do a groin vault ceiling, must the space above the ceiling not have a room so that the vaulted area reaches into space that would otherwise be the floor of the room above it? I know this is a question for most architects, but in your own home, is that the case?" The ceilings in the new house are a mix of 11' and 10' on the main floor. The 2nd floor is 9' ceilings. There is definitely finished space above the area with the groin vault ceiling, but the area with the groin vault ceiling is lower than the adjacent rooms, I suppose to accomodate the structure of the vault. My architect likes to have varying ceiling heights as part of the architecture of his homes, and to give a sense of hierarchy in the house. Holly, it looks so grand! Wow, 10 and 11 ft ceilings. It will be magnificent - you must be very excited by this part. The vaulting is glorious! Cannot wait to watch progress - I know I will be so inspired (sadly I cannot lift the roof on my house)...but will plant ideas for next time! I am learning so much about architecural detail from you, but after the perfect canvas, my favorite is still the decorating! Can't wait to see Suzanne and your selections. I love the vault ceilings and the mix of ceiling heights. I know it is going to be beautiful! Interesting technical question- thanks for the answer. Holly, What an amazing ceiling! I am excited to see more of your new home. 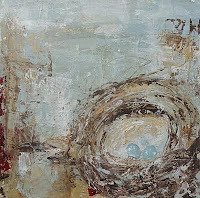 I just came across your real estate listing for your current home, it is absolutelsy beautiful! Our friends sent it to me and the minute I saw the foyer I knew it was your home. Beautiful! Good luck selling, but I don't think you will need it. I love the groin vault ceiling in your new home.